If the Jets haven’t hit rock bottom yet, then the 2014 season is going to be one to flush down the toilet. Sunday in San Diego, the Jets offense but up one of the worst performances in recent history, not scoring a single point between two ineffective quarterbacks in a 31-0 loss to the streaking Chargers. It was the first shutout loss for the Jets since a 34-0 thumping vs the 49ers on September 30th, 2012. How bad was it? The Jets didn’t make it across the 50-yard line until 7:35 left in the fourth quarter, and that’s only after a 33-yard gain on a pass interference call against Richard Marshall. The Jets had only four first downs through three quarters. Rex Ryan finally pulled the plug on QB Geno Smith, pulling him at half for Michael Vick. Smith was only four of 12 passes for 27 yards with one interception for a rating of 7.6. Vick was 9 of 20 for 47 yards. While the offense stunk, the defense didn’t exactly shine. 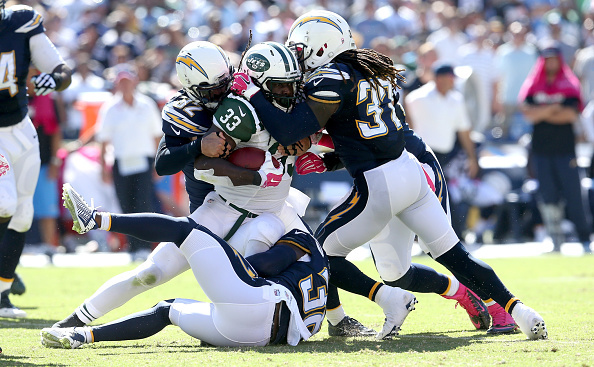 Bolts QB Phillip Rivers threw two touchdown passes to Antonio Gates and the Jets also couldn’t stop rookie running back Branden Oliver. Rivers had his way with the Jets. He was 20 of 28 for 288 yards and three touchdowns, with one interception. Oliver had a 9-yard touchdown catch in the third quarter on a drive he kept going with a 52-yard run. The free agent from Buffalo ran 19 times for 114 yards and caught four passes for 68 yards. Jets coach Rex Ryan said after the game that Smith would go back to being the starter for the Jets next week. At 1-4, someone has to step up for the Jets – otherwise this season will be totally over by Halloween.